A little disclaimer before I continue on with this post: I'm really happy--ecstatic, even--that someone (Aksys) decided to bring Chunsoft's Extreme Escape Adventure: Good People Die to the North American market. That said, I'm not as happy with the name they chose for this particular localization: Zero Escape: Virtue's Last Reward. (Pre-order the 3DS version here and the Vita version here.) 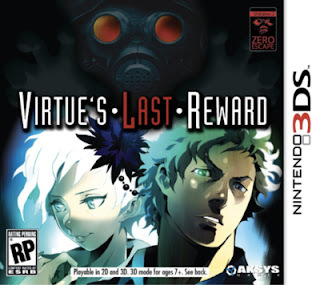 A much more appealing one, in my humble opinion, would have been something like Zero Escape: Good People Die. As I said in this previous post, I consider the latter to be one of the best examples of 3DS cover art. The former? Not even in the same league--thanks in part to its scrunching of Kinu Nishimura's beautiful illustration and thanks in part to its use of, as the guys at tinycartridge.com call it, "the TurboGrafx-16 font." All of the above is just my opinion, of course. What's yours? TG16 font! I wouldn't have noticed! How hilarious. This one's a bloodbath, Bryan. The Japanese one wins, no contest. Oh yeah, original art win hands down. Yeesh, the floating heads of the American one really ruffles my feathers. Justin: I looooooooved that the guys over at TC caught the TG-16 font. I probably would have caught it myself, but you know what they say about the early bird. Anyway, I agree that it's a bloodbath this time around. Yowza! Hey there, LA! Thanks for sharing your thoughts. I have a feeling no one is going to vote for the NA art this time around, but you never know! Alois: I agree about the floating heads. Why'd they have to do that?? Simon: Why does your response not surprise me :P Of course, I rather like the hunk to the right of the cute anime chick, so I guess I can't talk, huh? idk in this case I kind of prefer the NA art. Just looking at the JP art I can't really say I know what this game is or why it's interesting. But the addition of gas-mask dude, and his positioning in a trinity with the other two, suggests some sort of supernatural conflict and would motivate me to pick up the box and look at the other side. while the JP art is definitely beautiful and detailed, I think the NA one is more evocative. Nevertheless, I'm very excited for this release and will be picking up a copy, too! I'd say the Japanese cover is, of course, way better, but the NA cover at least has some attractive people in it, drawn in a unique style... so it's better than your average cover. Wish we didn't have to deal with the "Playable in 2D and 3D etc." line on the front of boxes. But it really is interesting what a difference the black vs. white 3DS side bar makes. The black is more modern, sophisticated, classy. Get on it, Reggie! DavidR: I'm with 100% when it comes to that stupid "Playable in 2D and 3D" line that appears on every NA 3DS game box. What's up with that? Also, like I just told Anne: I'd really like to see these black bars be used on NA game boxes, too. 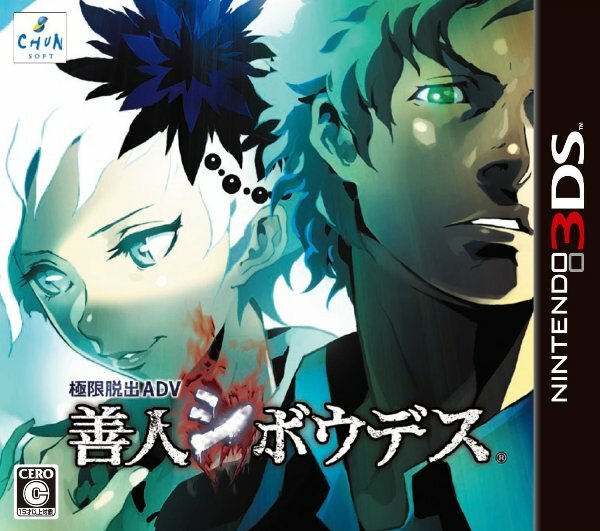 Wow, sounds like a Japanese game version of Saw series. Also, the Western one looks better.